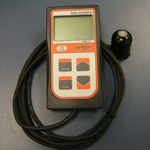 The 240-MP-200 Pyranometer has a hand-held meter, attached via cable, that displays and stores measurements in W m-2. The sensor incorporates a silicon-cell photodiode with a rugged, self-cleaning sensor housing design. Typical applications include shortwave radiation measurement in agricultural, ecological, and hydrological weather networks and solar panel arrays. The meter has a sample and log mode, and will record an integrated daily total in MJ m-2 d-1. Sample mode will record up to 99 manual measurements. Log mode will power the meter on/off to make a measurement every 30 seconds. Every 30 minutes the meter will average the sixty 30 second measurements and record the averaged value to memory. The meter can store up to 99 averages, once full it will start to overwrite the oldest measurement with new ones. An integrated daily total will be recorded from the 48 averaged measurements (making a 24 hr period). Sample and log measurements can be reviewed on the LCD display or by downloading the data to a computer, however, the integrated daily total can only be viewed by downloading the data to a computer. Downloading data to a computer requires the 240-AC-100 communication cable (a standard USB cable will not work) and ApogeeAMS software.